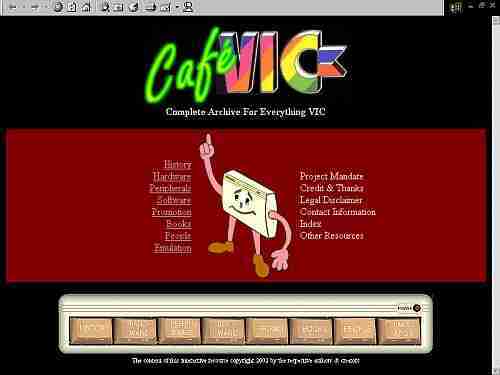 Development Headquarters for the VIC-20 History CD-ROM Archive Project. The development of CafeVIC has stopped. However I am happy to say that as of the summer of 2007, the goals of this project have been taken over by the DENIAL WIKI (http://sleepingelephant.com/denial/). DENIAL is currently the internet hub of all things VIC. I have passed on the CafeVIC data to several members and as a member myself I hope to contribute to the success of the DENIAL WIKI. This small site is here to explain our project to newcomers, and act as a central place for people involved in the project to get news, information, and files. Wasn't there already somebody doing the same thing? Yes, Ward Shrake of the Digital Archaeology web-site was doing it, but he's since become involved in other things and so he's officially handed the project over to us. Ward still remains an honorary member of the development team, and has already collected a huge amount of material which will go onto the CD-ROM). His digital archaeology site was last seen at "www.digitpress.com/the_digs/vic20/" but this page may now be off-line. Fortunately, it is also mirrored by Roger Sinasohn here. Of course there is also funet's Commodore archive, which hosts a large amount of VIC-20 material. The funet site is maintained by Marko Makela, and he is a member of this project too. I want to know more about the project (details, please)! Read the group's "manifesto"...the project proposal. Here's an ASCII file of the lastest version: projectproposal.txt. It will tell you all about the sections of the CD-ROM, and who is involved, and much more. I'm a VIC-20 enthusiast, and I want to help. How can I join? Well, apply to join our Yahoo! Groups e-mail discussion group at http://groups.yahoo.com/group/vic-project/. Also, please e-mail me at "woodenflutes@yahoo.ca" with a list of what you might contribute to the project, and we'll see about signing you up. Actually, I recommend that you e-mail me first so we can talk about your contributions. When will the CD-ROM be ready? How will it be distributed? There's a ton of work to do. We are all doing this in our spare time, around our jobs, educational pursuits, other interests and personal lives. So, we have not set a deadline. Let's just say that it will probably take a few years, but see the progress report below. We haven't decided how the CD-ROM will be distributed yet....it's too early for that...but it will probably be a not-for profit endeavour, so the members of the project will duplicate the discs and mail them out by hand. I have a question, or I have something to contribute, but I don't want to become a full-fledged project member. Okay, great! Contact me (Brent) at "woodenflutes@yahoo.ca" and I will pass it along to the group. Can I see a preview of the work? Also, you can actually explore the interface and its contents, on-line at this link. But please note that what you see there is a work in progress that is constantly being changed, tweaked, and added to! There will be many links that don't work yet and much information that still needs to be included. In case these look like web-pages....they are...we're using HTML as our CD-ROM graphical user interface so that it will be as cross-platform compatible as possible. MAIN: basic page complete, but no fancy welcome animation done. PROMOTION: The page has been set up, but no advertisements or promotional material has been added. Thanks to Roger Sinasohn for hosting some of the above files at his computer history website. Dec-14-2003: Finally some news! I received a massive archive of files & data collected by Ward Shrake. This is what I really needed in order to go ahead with the project. I will now combine my own massive collection of images, files, documents, etc. with the stuff Ward collected. This means a lot of work, and should take several months. After I have organised this 'raw content', Marko Makela will create the interface in HTML. Sept-13-2002: You can now explore the project as it is being developed at this link. Please note that you are viewing a work in progress. Sept-12-2002: Marko Makela has done a lot of work whipping the HTML into shape, and generally re-writing it. It's now looking much better and is much more efficient. Soon we will be able to start work adding actual content to the Software Section. August-24-2002: This site was just created, so there is no news yet! I released the first draft of the project's HTML interface to the group today for comments, suggestions, and generally so everyone could get an idea of the structure of the interface. Site created and maintained by Brent Santin, contact "woodenflutes@yahoo.ca".